As part of their 80th anniversary, Topps has launched a year long online set focused on wrapper reprints of Topps sets through the year. Last week GPK made their first appearance with a wrapper based off of OS 1 from 1985. 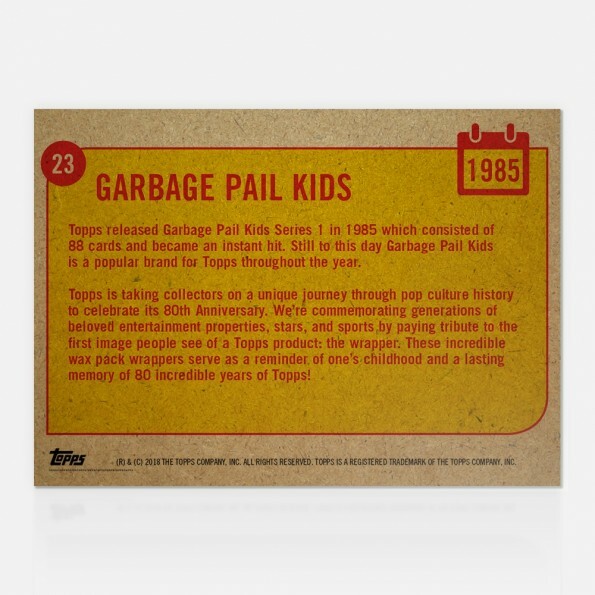 Today Topps revealed the print run for the 80th Anniversary Wrapper Art Card #23 1985 Garbage Pail Kids. In a bit of a surprise sales of the GPK card smashed sales records for the set. According to Topps the card sold 969 copies. With 24 cards so far released in the set, the card becomes the highest selling card to date. The previous highest card, was card #1, 1966 Batman, that sold 707 copies. What do these results tell Topps? Does it show there’s a large following for classic GPK stuff? Could it mean additional GPK wrapper cards will make an appearance later in the set? Would Topps use these results to change their minds on a product like Chrome OS 3? Lots of interesting questions for Topps with sales results such as these. As part of Topps’ 80th anniversary celebration they are offering classic reprints of wrappers from the products they’ve offered throughout the years. Today Topps launched the 80th Anniversary Wrapper Art Card #23 – 1985 Garbage Pail Kids card and poster. The OS1 GPK wrapper reprint is the 23rd card so far in the set, as Topps offers 3 new card per week. The front of the card features the OS 1 wrapper, while the back has a writeup on OS 1 and the 80th wrapper set. In addition to the card, there are also two posters being offered. The regular 10 x 14 poster features the wrapper reprint along with a writeup along the bottom about the OS 1 GPK set. There is also a special 1/1 gold version of the poster. The card is available by itself for $7.99, or you can purchase 5 for $27.99 or 10 for $44.99. The card can also be purchased along with the other two cards being offered this week for $14.99. The regular poster is available for $19.99 each. Topps also offered the special 1/1 gold version of the poster for $99.99, but quickly sold out. Shipping on both the card and poster is free within the US when choosing the SmartPost option, while international shipping is $10. The card is available for 7 days on topps.com, while the regular posters will be continue to be for sale. Topps will announce the print run of the cards at the end of the sale.